MONKEYS ARE MY FRIEND: It's an Upset! The results are in! 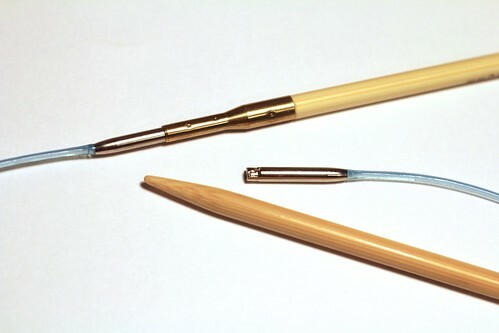 After much venting, babbling and hand-wringing, I've finally settled upon my perfect wooden interchangeable needle set - and you won't believe what I picked! At the end of my last post, I had some favorites but knew I couldn't decide which one I would truly love until I had knitted with them a bit. So I've taken a few hours to knit some swatches and tubes and even a little heart (which Dan felt did not look at all heart-like but rather like a more southernly bit of anatomy) and I've come to some conclusions. I really thought these needles might be the one. 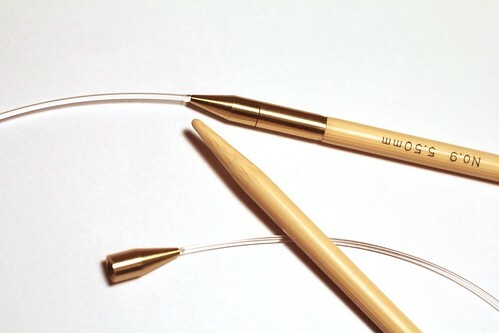 They are smooth, silky and warm with lovely points (which are quite pointy for bamboo) and the cable is delightfully flexible and memory-less. They are longer than any of the other needles I have, but that didn't seem to be a problem at all when I knit with them. 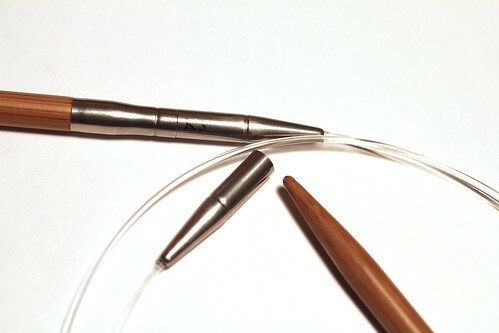 In fact, it was quite nice and they didn't hit my hand in the same way the KP needles do, so I was quickly comforted that I wouldn't end up bending the cable against my palm. These seemed so great - I was totally prepared to want them. And then I knitted with them for a while. The join! It's awful! That little lip between the metal on needle and on the cable caught every single stitch of yarn. And I was using an aran-weight 100% wool and not knitting tightly. I can only imagine how catchy it would be with a less friendly yarn or on a smaller needle. Ultimately, I think these are good quality, well-done needles, totally ruined by the join. I would be more than willing to check out Addi DPNs or straights and maybe even fixed circs. But any Addi interchangeable is off the table for me. I was a bit concerned by the little divot where the metal connects to the bamboo on these needles. But my concern was unnecessary - these are delightful. They are smooth, silky and warm with fantastic cables. The cable probably corresponds to KnitPick/Knitter's Pride cables but they swivel - this one is probably my favorite cable of the bunch that I tried out (though I've only tried this one size of KA Switch cables; I believe there are two other thicknesses that correspond to needle diameter which I have not played with). The smoothness of these compares to the KP needles as well, though knitting with the KPs after using these made me feel that the KPs were a bit uneven, almost like certain areas were stickier than others. The points aren't as sharp as the Addis, but I never felt they were too dull. The join on these are great - most of the time the stitches flowed wonderfully over it. The only time I had an issue was when I pulled the last stitch too tight while Magic Looping, making me have to work it a little to get on the needle. But that's my knitting's fault, not the join. Bottom line: I really really like these. I would love having a set of these. In fact, I can't really think of anything bad about these needles. Well, maybe that they are harder to find than other brands. But seriously, great needles. I was not impressed by these when my order showed up. I grumped both about the plastic-y feel of the resin-impregnated bamboo and the cheap-looking and -feeling metal join. Well, I was half-right. I don't like the bamboo on these. It feels like knitting with acrylic needles - there's an almost nails-on-a-chalkboard feeling in my bones when I use these. They are also by far the grabbiest interchangeable needle I have tried. (My fixed Clover circ still ranks as number one for stickiest overall needle.) I didn't enjoy these. Okay, that's not fully correct. There was a bit of knitting with these that I did enjoy and that was when the stitches would go over the join. OMG, it was fantastic. The join is just beautifully smooth. And that metal that I didn't find impressive? Like butter. It's so great. How are the HiyaHiya Steel needles? First let me explain my dislike of metal needles. Certain types (like KP's nickel-plated) are too slick and too heavy. When I'm knitting and take my hands off of the needles, they have a tendency of falling out of my work. I detest this. Aluminum (like Boye) tends to not be as slick or heavy, but they have a texture to them that makes my ears ache with the soft almost-grinding when they rub up against each other. But the HiyaHiya Steel? Are practically perfect. And I don't say that lightly. I am predisposed to disliking metal. But these are everything I want in a needle. The joins, as I mentioned with the bamboo ones, are wonderful - they are so nicely tapered that the stitches, even too-tight ones, slide right up. The metal is silky smooth, not glassy slick. When I say silk, I mean silk - it's just like petting a silk shirt. They rank as less grabby than laminate wood needles but grabbier than nickel-plated needles, which I think is fantastic. And these needles are apparently hollow so they don't have the weight that many other metal needles do. These are light enough that with as few as just two stitches on the needle they stay securely in my work. Two stitches! The cables swivel nicely (I had an issue with the swivel on the bamboo initially but that smoothed out quickly - it's still not as perfect as the KA swivel but good enough that I wouldn't realize it could be smoother if not for the KA). There's a hair more memory, it seems, in the cable than my ideal cable, but the flexibility combined with the swivel means it doesn't cause any problems (Magic Looping is cake). I also love the fact that all of their metal needles come in both 4" and 5" sizes (though I'll be going with the 4"). Probably the only complaint I have is that the points are a bit duller than what I would prefer but that's not really a problem because 1) they are pretty much the same point as the Addi Naturas, which I didn't have an issue with and 2) I accidentally ordered a pair of the HiyaHiya Steel, not the HiyaHiya SHARP Steel so yes, there are sharper versions out there (though the larger diameter needles won't be released until later this year). There is a tiny bit of whooshing sound as the needles rub together which I don't love (I like the quiet, dull tap of wood needles) but it doesn't give me the heebie-jeebies, isn't as loud as brands like Boye and doesn't sound like glass pieces tinkling together like KP metals, so I'm cool with it. I love these needles. 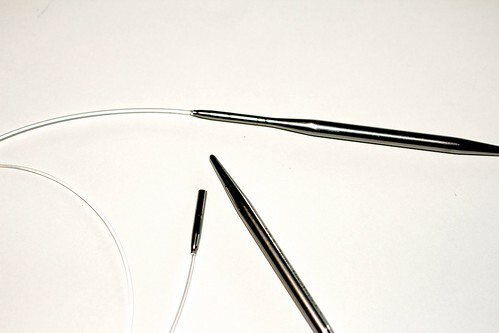 I will be buying these needles (in the SHARP version) in the next few months (well, the smaller sizes set... the larger sizes will have to wait until, you know, HiyaHiya releases them). Ironic, yes? My search for the perfect wooden interchangeable set has resulted in me deciding to get a set of metal interchangeables. But that's not quite the end of it. I love (LOVE!) the HiyaHiyas. But I'm quite partial to the KA Switches, too. If I was forced to get just one set, I'd go with the Hiyas, but if I was forced to get, you know, a wood (okay, bamboo) set, I'd go with the KA Switch. And I can imagine a situation where I'll need maybe something a tiny bit grabbier or need a second (or third) set of needles in a particular size or some other point that will help me justify getting more than one set of needles. So that's what I want to do: get both the HiyaHiya (specifically the 4" SHARP set) and the KA Switch set. Ta-da! The winners! I'm really pleased with this whole adventure. I fell in love with a needle (metal!) that I probably wouldn't have looked at otherwise, confirmed that another needle (the KAs) are a good match for me as well and now have the confidence that the needle sets I'll end up with are the perfect ones for me. your posts have helped me so much!!! thank you for going out and testing all these different sets! Thank you - I'm glad you found it helpful! I appreciate all of your testing and comments. I'm shopping for a set as a gift (to me from my mom) and these blogs were very helpful. I'll let you know what I end up getting!